A brand new bridal experience and the Best of the North West! Specifically, I’m going to tell you about the launch of a much-anticipated bridal boutique in the North West. Until today a closely guarded secret known to a very few wedding industry insiders, it’s now official: two of the most popular wedding suppliers in the North West are opening their own luxury bridal boutique! Love Bridal boutique opens in Cheshire! 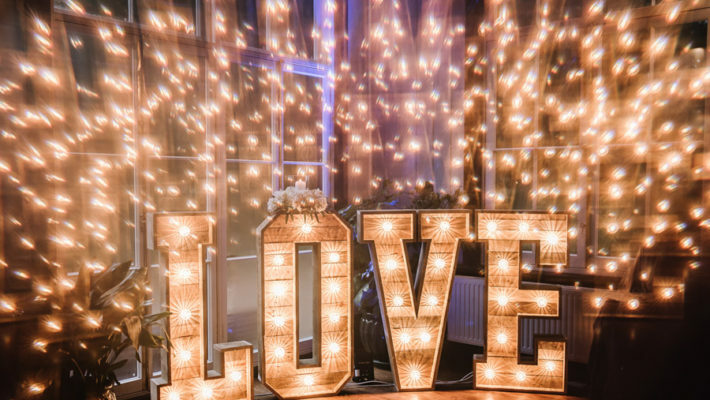 Love Bridal is being opened by Emma and Jonny Draper – who’ve both had their work featured on English Wedding Blog before in their roles as bridal boutique manager, make up artist and wedding photographer. London wedding photographer Anneli Marinovich tells their story: “I had to laugh when Gemma told me their engagement story – Chris had been standing in the little square near their house, when she walked up to him, put her arms around him and blissfully unaware, stuck her hand in his back pocket…only to find a ring box with her engagement ring inside! Morning everyone! I hope you’re enjoying a peek at some sunshine this morning, wherever you are! Today’s real wedding fits beautifully with the bright day we’re supposed to be having: the bright floral bouquet sets the scene for a fun, romantic and personality-filled wedding day. I’ve just been asked to share my thoughts on original wedding themes for a press interview, and I told the reporter the most standout weddings for me are all about personality. Hannah and Nathaniel are the perfect example of that – as Hannah’s wedding report says, “we decided that we didn’t want a theme. It was important to us that our guests felt like the wedding was a true reflection of “US” so we chose things that we liked” – and if you ask me, that’s the best way to plan a wedding. 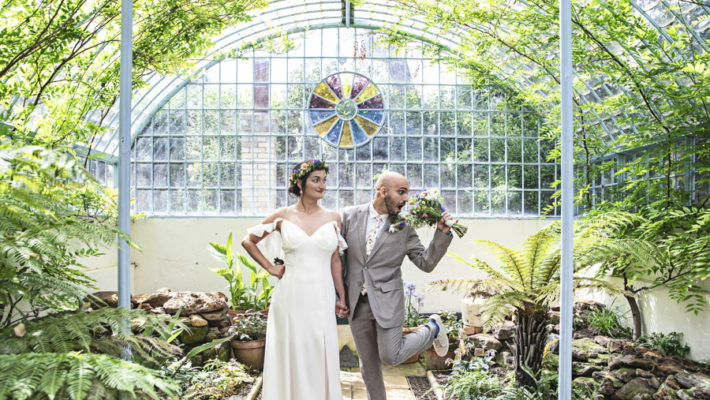 The images of their day, submitted by the lovely Northampton wedding photographer Aaron Collett, will show just how glorious their wedding day turned out to be. Classic wedding styling meets Glastonbury festival! 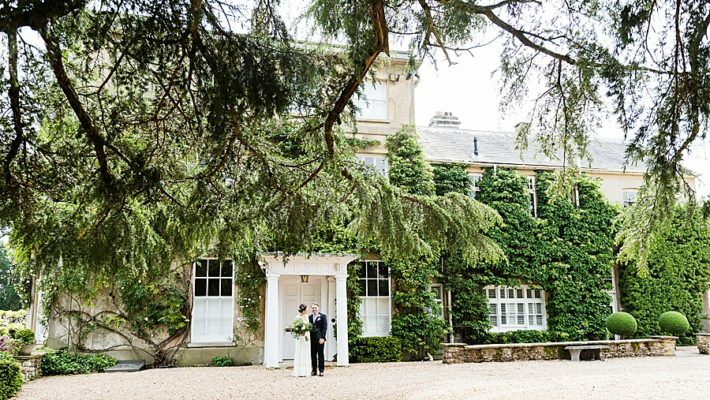 I absolutely adore this and I hope you will too: Louise King and Jamie Green were married at Denton Hall in Yorkshire, and mixed the best of both worlds for their wedding. 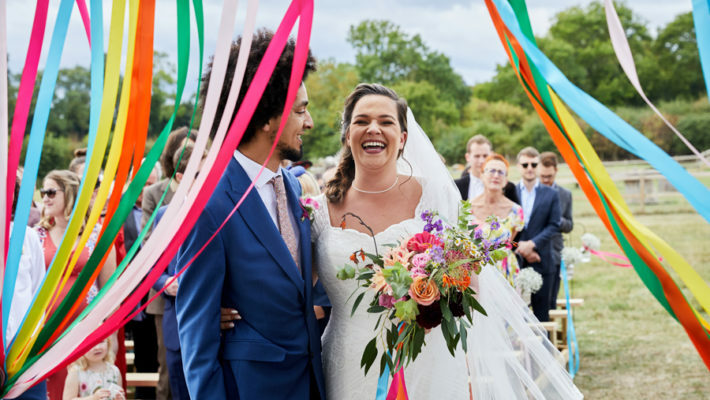 They chose a luxury venue and beautiful styling to set the scene for their day, and incorporated their personalities in a fun and charming way with a Glasto theme: festival flags, their very own beer and CDs for wedding favours are just a few of their festival wedding ideas. 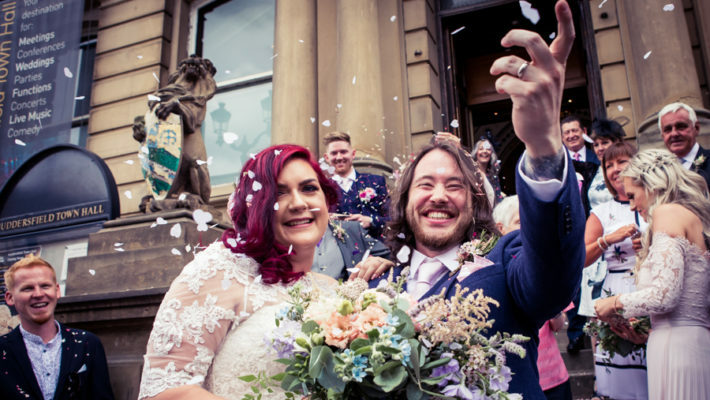 I love this wedding: it shows how a theme can be a flavour of a wedding day without taking over, and there’s a delicious sense of fun at one of Yorkshire’s most elegant wedding venues – those flags are fantastic! Sad but true: on her days off, this wedding blogger likes to play on wedding invitations with her calligraphy pen! So when I got a lovely chunky parcel from Paper Themes last week as a prelude to their fab competition I kept it unopened until Saturday morning so I could have a proper experiment with their gorgeous wedding invitations. The new wedding dress collection from Temperley London was revealed to the press last Monday, and I’m pleased to share my favourites from the collection with you here today. The dress designs are incredibly beautiful – and all the images on this blog post are shown in the order I love them most! I adore the elegance of these dresses, the way they flow and the way they’ll move. The exquisite lace patterned back of the Estella dress stops me in my tracks (imagine the oohs and aahs as you walk down the aisle!) while the simplicity and grace of Chloe with the delicate flower embellishment is just divine. 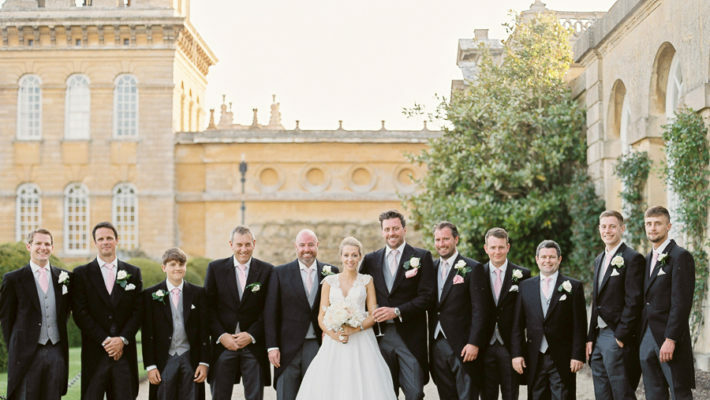 A Vera Wang wedding dress… Louboutin shoes for the bride and bridesmaids… horses and carriage… a wonderfully luxurious country house wedding venue in the Cotswolds… top hat and tails for the groom… and award winning wedding photographers. So much to show you today, such a gorgeous wedding – and you know, for me the very best bit about Emma and Burnsy’s wedding is the love and laughter. 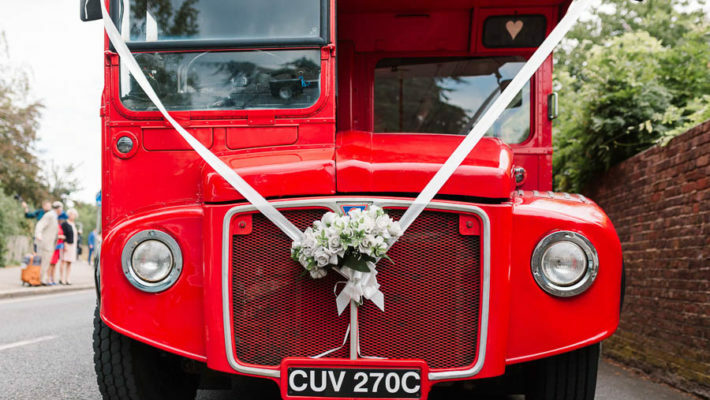 Wedding planning: can you be too organised? I have admiration and astonishment in equal measure for couples – and let’s face it, mainly brides-to-be – who plan their weddings. Co-ordinating everything from guest lists to menu choices, sending invitations and remembering to order everything from top hats to garters… I can’t even begin to imagine how you do it. It takes 18 months to plan your perfect day… or does it? The average time to plan a wedding in the UK is 18 months, I believe. Wedding magazines, websites and books offer wedding planning checklists and guides telling you what needs to be done when: have you taken out wedding insurance? ordered buttonholes for the ushers? Do you know when to order your wedding invitations? Can you plan your wedding too far in advance? Weddings and marriage: how to get the money right! I get a lot of emails with suggested features for my blog. Some are OK, some are great. This little feature is a quick read, but stood out from the crowd because the advice here is so good. Simple, easy – and really sound advice about money. Although as a wedding calligrapher I’m not sure about a paper-free wedding! 1. Reuse floral pieces: Using flowers for your ceremony decorations? Think about designs that will easily translate from ceremony to reception to cut back on floral costs. Many pieces that you have for the ceremony can easily be used into the reception décor, such as your bridesmaids’ bouquets and aisle flowers. I can’t tell you how much I’d love to be sat here with my laptop, wearing a few choice pieces of beautiful designer bridal jewellery as I type. Sometimes a wedding blog post feels like an occasion, and this is another one of those where I’d rather be dressed up before I start typing. Still – it’s not about me. I write English Wedding Blog for all of you lovely people, and not just because I love it! Today’s blog post is all about wedding jewellery inspiration and comes from the lovely Trudie Arnold – designer at Tiaras by Trudie Arnold. Trudie submitted this recent photo shoot which involved her bridal tiara and jewellery designs as well as an amazing vintage car from the Classic and Vintage Car company, 1930s Hollywood inspired hair and make up by Vivienne Moore, and a beautiful ivory lace wedding dress provided by Cloud 9 Bridal Wear in Surrey. Photographer Dean Whiting captured all the images. Some people like gritty realism and enjoy that whole ‘fly on the wall’ thing. But not me. Far from it. My world came pre-loaded with a rose-tint filter and I eschew anything that threatens to shatter my lovely illusions. Nevertheless, when things aren’t going quite to plan, it’s sometimes reassuring to know that you’re not alone. So, if you’re struggling prevent your usually sunny self from morphing into Bridezilla and are feeling bad about wanting to tear your hair out during what everyone says is the most exciting time of your life, take heart! You’re not alone. Mrs Moore-to-be may not know you, but she’s with you in spirit.